Lovingly Handmade Bath Melts using Rose Essential Oils and beautifully decorated with vibrant colours. The stunning scent of roses really is one of a kind. 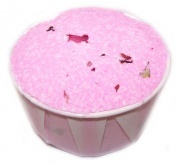 The everlasting symbol of eternal love, the Relaxing Rose Bath melt is a perfect gift for your loved one or an ideal treat to help you unwind after a long day. Just breathe in the rose oil scent and let the stress wither away! Just remove the paper case and melt the contents into your hot bath!